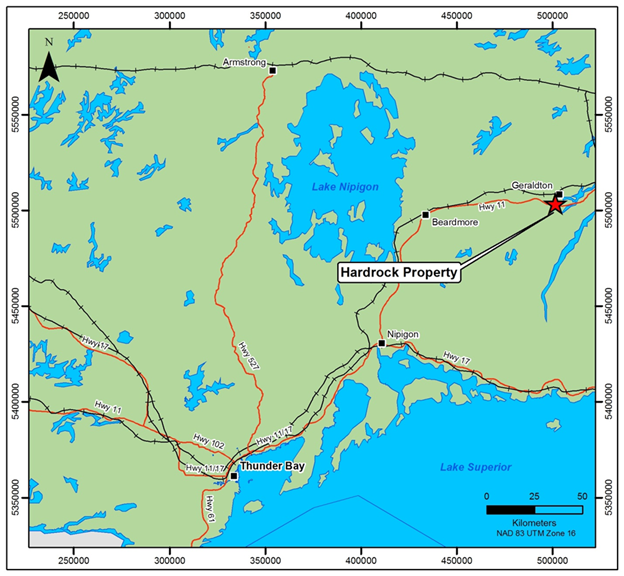 The Hardrock Property is a contiguous block of ground and consists of 292 patented claims, leases and Licenses of Occupation covering approximately 5,148.3 hectares, and 39 unpatented mining claims covering 10,128 hectares for a total approximate area of 15,276.3 hectares. The property is located in Lindsley, Errington, Ashmore, Parent, Salsberg and McKelvie Townships in the Thunder Bay Mining Division. The property is situated in the Thunder Bay Mining Division of Ontario, located approximately 275 kilometres northeast of the city of Thunder Bay, Ontario and approximately 2 kilometres south of the town of Geraldton, Ontario. The city of Thunder Bay has a population of 110,000 and provides support services, equipment and skilled labour for both the mineral exploration and mining industry. Rail, national highway, port and international airport services are also available out of Thunder Bay. The Municipality of Greenstone and surrounding communities can provide supports services, equipment and skilled labour for both the mineral exploration and mining industry. From Thunder Bay, the property can be reached by travelling east on Trans Canada Highway 11/17 until one reaches the town of Nipigon and then north along Trans Canada Highway 11. The property can be directly accessed via Highway 11. The property is accessible year round from Geraldton or Highway 11, which crosses the property from east to west. The southern portion of the property is accessed via Highway 11. The remainder of the Property can be easily accessed by four wheel drive vehicles via numerous logging/bush roads that branch off of the paved highway. Those areas of the property that are not serviced by roads can be access by ATV, on foot or by boat in the summer and by snowmobile during the winter months.